It was a night for all things rhythmic down at the Chevron Festival Gardens (hello arts-corporate complex), under the cold, monolithic gaze of nondescript office buildings. Before the main event, The Brow entertained the revellers who came early as the sunset approached, bringing covers of hip-hop hits of yesteryear. The small stage was rather cramped for the large ensemble given the size of their instruments, but they made do with what they had, entertaining the small crowd who lounged on the grassy knoll. 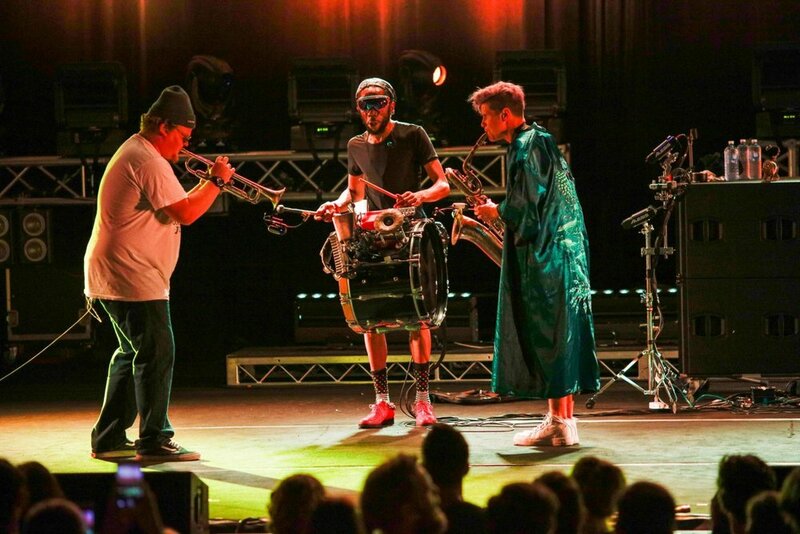 Kicking off straight away with nary a word with brass all blaring, was Too Many Zooz, who started life as buskers on the New York metro’s famed subways, bringing the sounds of the subways of New York city straight to the ears. The saxophones and the drum beats rang for nearly an hour on end, and the band looked exhausted by the end of their set. Too Many Zooz didn’t do too much of the banter, much preferring to let the music do all the talking for them. The atmosphere was fun, if somewhat lacking in the crowds, who nevertheless got down to the boogie with a lot of enthusiasm. Shigeto- photo by Cam Campbell. Shigeto then came on stage, introducing himself by getting straight into the action, and would close out and depart without even a single word from start to finish. Shigeto’s work is hard to pin down, as it musically moves fluidly between ambient, pop, post-rock and pure electronica, and sometimes more than one at the same time- and experimental music of this sort from East Asia has been largely making waves . Shigeto's music was just the right kind of decibel to be hypnotic- I can attest to nearly falling asleep in the middle of dance moves. That one man would be performing his entire set without a moment to rest is admirable in its own regard.